Kaliningrad is the westernmost region of Russia, famous for its mild climate, beaches, and amber, of which it has 90 percent of the world’s supply. The history of this Russian exclave as such is relatively short: prior to Nazi Germany’s defeat in World War II, it was East Prussia, and as German as Hamburg or Munich. With the end of the Third Reich and the arrival of Soviet rule, however, came also brutality and the physical destruction of a culture and people that had existed in the region since medieval times. In 1946, out of the old city of Königsberg was created Kaliningrad—named in honor of the late Mikhail Kalinin, the powerless Soviet head of government under Stalin. The Germans living across eastern Europe—including East Prussia—were roundly expelled in a forced migration to Germany proper. The violence of this process claimed millions of lives. 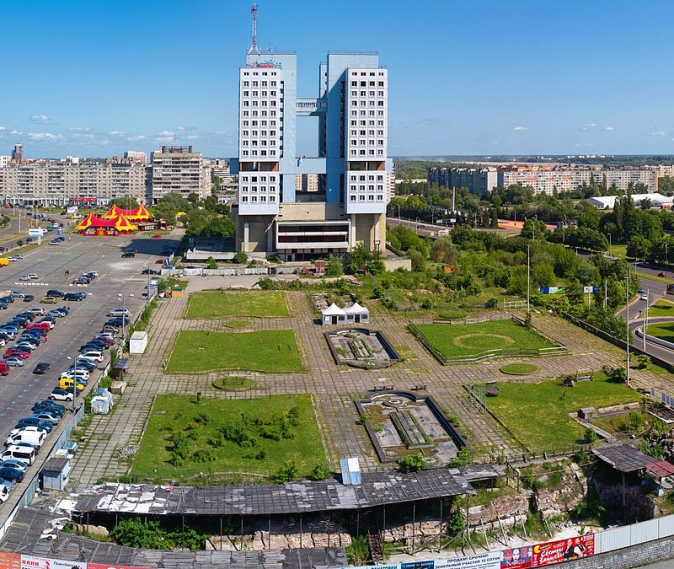 Architectural vandalism committed by the new Soviet authorities leaves other historical scars in Kaliningrad. Königsberg had been the biggest trading hub in the Baltic and a major cultural center; it was home of towering Gothic churches and medieval castles. The city, well preserved for around 750 years, is now only visible in prewar photography. Granted, Königsberg had sustained heavy bombardment in the war, whether by Allied air raids or Soviet artillery shells. But many of the sturdy German buildings, including Königsberg Castle, the city’s main landmark and a construction of Teutonic knights dating back to the 13th century, were structurally intact. Kaliningrad authorities initially planned to renovate the castle as a museum for local history, but Moscow disagreed. 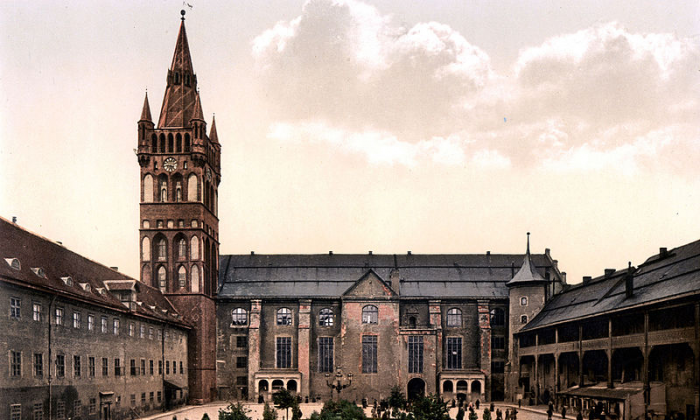 Other buildings, particularly churches, were treated similarly—instead of being renovated or rebuilt, the Soviets took the opportunity to demolish them as traces of “Prussian militarism” and blamed the result on war damage. Ironically, bricks from the demolished buildings were recycled for use in other Soviet cities, and German construction workers were employed to rebuilt several prominent buildings in Moscow. 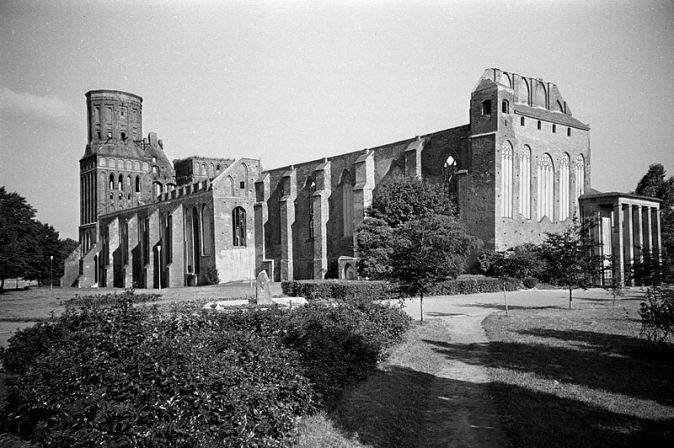 The Alstadtkirche was one such landmark destroyed as a result of “war damage”—the Gothic church was heavily damaged by air attack but still standing. Initially, the local government planned to preserve it because it was designed by prominent architect Friedrich Schinkel. Nevertheless it was demolished as a source of surplus bricks. Other churches in East Prussia met a similar fate. 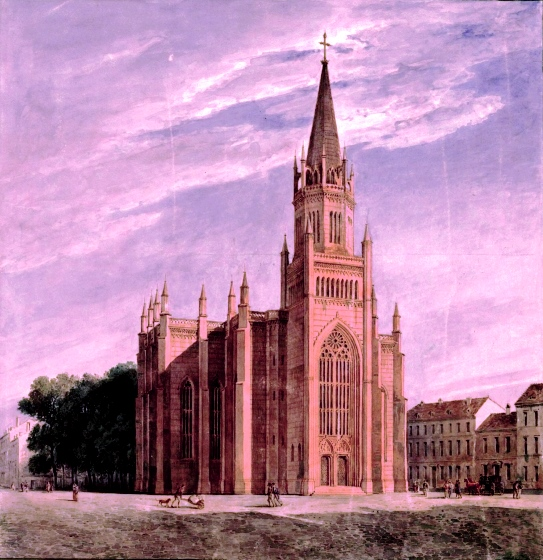 The Lutherkirche, which survived bombing of Königsberg mostly unharmed, was blown up in 1976. The Communist Party destroyed numerous churches in Russia and had even less mercy for German churches. Not everyone liked what was happening. An anecdote from the first Soviet settlers in Kaliningrad condemned those who participated in the demolitions. The Königsberg Cathedral may have gone the way of the Teutonic castle were it not for the onsite grave of philosopher Immanuel Kant. The Soviet government left the damaged building intact, and it was renovated in the 1990s following the collapse of communism. 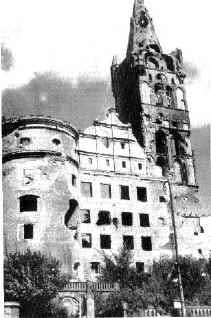 The destruction of German heritage was continued even outside Soviet territory, in occupied East Germany. The Berlin city palace, like Königsberg castle, was regarded as a symbol of militarism and ordered destroyed in 1950 by East German communist leader Walter Ulbricht. Its reconstruction was begun in 2013. In Kaliningrad, as was typical of communist bloc states, the need for mass housing inspired the construction of massive concrete apartment complexes, colloquially called “khrushchyovkas” in the Soviet Union for the communist leader, Nikita Khrushchev, under whose term they were built. Much old architecture was destroyed to make way. It’s appropriate to compare Königsberg’s decimation with other cities in the region. Danzig (today Gdansk), another port on the Baltic Sea, received 70 to 80 percent destruction of its city center by aerial bombardment. After the war, Gdansk was similarly depopulated of its German inhabitants and placed under the administration of Poland. But instead of demolishing the old architecture, the local government reconstructed much of it, even those buildings completely destroyed. Renovation of old buildings has continued into the 21st century. Today Gdansk, with around 1,000 years of history, is Poland’s most popular tourist destination and attracts visitors from all across Europe.